On a recent “Name that Amish community” post, the question came up of Amish living in British Columbia, Canada. In fact, no Amish live in British Columbia, though other Anabaptist peoples, including Old Colony Mennonites and Vietnamese Mennonites, live in the province (see Concise Encyclopedia of Amish, Brethren, Hutterites, and Mennonites). Today, Amish in Canada live only in Ontario, in over a dozen settlements. That noted, for one brief period in history Amish were to be found in British Columbia–if only a handful of souls. David Luthy reports on a short-lived British Columbia Amish settlement, located near the gold rush town of Horsefly (formerly Harper’s Camp). 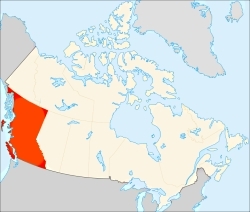 Horsefly is found in the Cariboo Region, a vast forested and mountainous area in southern BC (see David Luthy, Why Some Amish Communities Fail: Extinct Settlements 1961-2007). Jonas M. Hochstetler, an Ohio farmer and sawmill owner, found himself drawn to the abundant timberland in the Cariboo Region following a visit in the winter of 1968-9. Hochstetler and family moved to a 400-acre farm the following spring. The next year saw a few more families arriving to set up house in the fledgling community, including Jonas’ married son, Martin, and two more families (one from Ohio, a second from Indiana). Only a few Amish families ever settled in Horsefly, however. For various reasons the newcomers had soon returned home. By spring of 1971, Martin and his wife Susan were the only Amish left. As Luthy explains, the couple were reluctant to leave their ranch. “They knew that no matter how much they loved the beautiful area, it held no future as an Amish settlement. It was an unrealistic location, being too different in its farming practices and too distant from other Amish settlements” (Why Some Amish Communities Fail, p. 9). With the birth of a son, and little hope of any other Amish (much less a minister) joining them, they resigned themselves to the inevitable. Martin and Susan left British Columbia in summer 1972, later publishing a book about their experiences, entitled Life on the Edge of the Wilderness. More on the Amish in Canada to come–this Friday we’ll be posting the Canada Amish guide. 11 responses to Amish in British Columbia? That is a beautiful region. We went out there in 2006 but left before fall, for about the same reasons. Winters are long and dark there; the remaining farm land was north of where we wanted to settle. I knew an Amish family from Ohio who went to B.C. I don’t recall whether they were just there for a visit or whether they lived there for a spell. They returned to Ohio temporarily and now they live in Montana. I live in Alberta and sometimes wonder why the Amish haven’t ventured out this far. Granted, we don’t have the rolling green hills of Lancaster, the beautiful forests of Ontario, the warm weather and long growing seasons of the South. But plenty of Anabaptists do live here – mostly those of Russian descent. Hutterites as well as Mennonites ranging from Old Colony to Holdeman to Mennonite Brethren. Many have been here for generations. My own grandparents grew up Mennonite. Why is it that the Dutch just haven’t seemed to venture this far? I didn’t realize there are Vietnamese Mennonites in British Columbia. Are some Mennonite churches historically established in Vietnam, or are these Vietnamese who have immigrated to Canada and they or their offspring joined a Mennonite church? Or have they become affiliated with the denomination through marriage? The world of Anabaptist groups is fascinating. One hardly hears about them directly, but obviously they have left their mark around the world. You probably will never see an Old Order Mennonite or Amish in Canada or the USA who is of Asian descent. The Mennonite movement, that is the more liberal, more modern level of it, is more outwardly evangelical, more willing to preach and minister to other cultures in the name of The Lord and The Savior for their salvation. There probably are Mennonites who have gone to Asia, Africa and other areas to minister and do missionary work there, they will do the same work in North America. These Mennonites probably see no real need for “the old ways” old modes of transport and dress, although I would imagine they appreciate them for what they are. Instead they would probably prefer to do their work for their faith in modern ways, living their faith in action rather than a style of dress or adherence to cultural tradition. That’s how I understand it anyway, they aren’t closed to the outside world, these not-Old-Order Mennonites among us. Order Man, actually, I googled “Asian mennonite” and “Vietnamese Mennonites” (something I of course should have done before posting a query here). Anyway there are indeed a number of Asian mennonites in the USA and Canada, even entire congregations, and the Mennonite church has been established in Vietnam for quite some time. Didn’t investigate if any are “Old Order” Mennonite, but, given how connected the world has become, I bet some are. Ed, there is no doubt your right, and that does fly in the face of a lot of peoples’ image of what a Mennonite is, or at least what he or she looks like. It is good that people from varied backgrounds choose to become Christians from the Mennonite way of it, regardless of where their ancestors are from. It is indeed interesting. Growing up I knew a family of Indian Mennonites (as in Asian Indian…not American Indian). As I understood, the father was evangelized by missionaries, and he was able to secure a visa at some point and move to the US. His daughter married one of the guys whose family was probably what you’d call more traditionally Mennonite (last name is very German!). But yes, the Mennonites come in all varieties! Most people here in the Dayton, Va area, are some for m of Mennonite. Many, not all have farms and enjoy their life style. I am impressed with their life style and how most are still living the old ways are not dying off, with undesire. There must be something to feel good about this life that they live. If our country was of a faith like this, we would be much better off. Noone is perfect here but, they do try to live the best way possible. They take a lot of rejection, harder life styles and hard work. This really forms (creates)a person too. They don’t tempt themselves with the world. I have never seen the need for it any way. There is just hurt and pain out there. I’d be much happier to if I was an Omish or old order, I am sure. I am blessed for thed most part to be amongst these mostly nice people. I ahve spoken to Omish that have vistited here and they hve been so nice. I may not agree with all of their beleifs but, I would rather live cosr to one of these for the most part than most anyone else. I know a few Doctors that work with them. Many are patients of theirs. The dorctors seem to be very happy working with them as patients. None of them are perfect but, they are working hard to be. On Vancouver Island there are several Amish Families, one raises Buffalo…In Courtney or Campbell River there’s a sign on the road saying Amish Furniture for sale…now, I don’t know if they are part of an Amish Community or have gone out on their own but they do exist there. Leave a reply to Amish in British Columbia?